That Aquino would banner the oligarchic practices of the feudal class, and Villar would pick up, Peron-like, the cause of the poor and underprivileged, is the classic rendition of �essentializing� class itself. But proofs point to the contrary. Otherwise, the mass mourning over the death of Cory Aquino was misplaced, and stupidly of bad faith. She lived like a stateswoman, and while the ideological structure of her regime left much for critics to deconstruct, the notion of hope that she resuscitated is something no militant so far has been able to provide on a grand scale. Villar is a bureaucrat-capitalist whose enterprises have eclipsed the earnings of hacendero paragons like Aquino. Can he still validly claim connection to the poor? He now works within the capitalist-corporate system integrated with the view of democracy that Wall Street approves of. 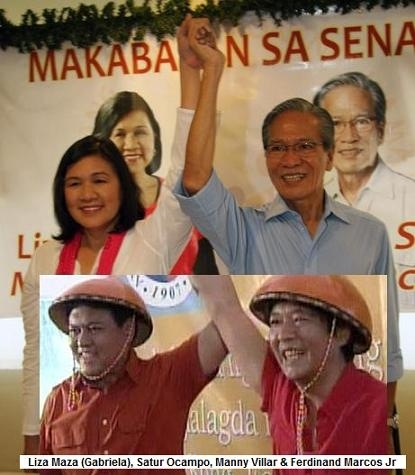 Even Jose Maria Sison has disastrously joined the fray, as if to rationalize Bayan Muna�s negotiated settlement with a party that falsely represents itself as a united front with the likes of Ferdinand Marcos Jr., the militarist Ariel Querubin, and the party-list radicals Satur Ocampo and Liza Maza. It�s as if Villar would enforce the National Democratic Front�s program of governance, which goes against the ideological construction of First World capitalism itself. The investment in the poor as election props is also Joseph Estrada�s, whom the unenlightened masses (the educational system has made them so) confuse as an articulation of their own affliction. It�s obvious enough: Suckers are born every minute and Estrada capitalizes on that. When will the classic Marxist struggle be done justice by so-called Left �agitprop� that does not see Marxism, in the words of Jameson, as an ongoing problematic? We must truly fear for the future! I heard Nacionalista Party standard bearer Manny Villar speak before a nation-wide audience over the Bombo Radyo Philippines network in a lame effort to deflect evidence that he was never poor, that his life story as depicted in his campaign jingle that he �swam in a sea of garbage, and had a kid brother die because they were too poor to pay for the hospital bills� was a big fraud. The way Villar talked, one can sense that his whole world is spinning out of control. It was filled with inconsistencies, and he tried to cover one lie with another lie. The thin ice is cracking under his feet. It was inevitable that Villar had to confront the issue that came out in the articles written by Winnie Monsod and Billy Esposo in the leading periodicals, Philippine Daily Inquirer and Philippine Star. These articles presented documentary proof to disprove the story that the Villars were a poor family in Tondo as the NP presidential candidate has been trying to project, and that the death of a three-year old brother was a consequence of their poverty. The most damning evidence consisted of a land title which Villar�s father had used to borrow money from GSIS to build a house and the medical certificate from FEU hospital where his brother died on Oct. 13, 1962. You can�t just pretend these issues don�t exist once Monsod and Esposo take them up in their columns. Besides, the issues are documented. Villar didn�t dispute the authenticity of the documents. He admitted they lived on Bernardo St., San Rafael Village in Tondo which, as pointed out by Monsod and Esposo, were upper-middle class neighborhoods of Tondo in the 60s. Villar also acknowledged the truth that his brother died at the FEU Hospital in 1962. But Villar insisted they were poor, and they indeed slept � all nine of them � on a single mat. He even went back to the old house on Moriones St., Tondo a few days later to show the media where, as he claims, they had lived. He didn�t detail the period during which they had lived there. Villar simply wants the Filipino people to take his word for it. It was also true, he said, that he had swam in a sea of garbage. He didn�t mention that in the 50s, the waters near Tondo were clean, and not used as dumping ground for garbage. And I can�t imagine any parent who would allow his or her child to frolic in �a sea of garbage� even if that was true. This is too much of a hard-sell, and Villar can�t expect the image of him being an impoverished child playing in unclean and unsanitary conditions to stick. Villar said his brother died because they had no money to buy medicines. Now the truth has broken to the surface � Danny was afflicted with leukemia, and the family sought every opportunity to get him treated. The death of Danny wasn�t because his parents couldn�t buy medicines. Death was inevitable; there was nothing money could do to stop the ravage of the disease on the human body. When the disease had reached terminal stage, the family brought Danny to the FEU hospital. The death certificate is hard to refute, so Villar tries to spin another angle to perform a Houdini act of slipping out of this bind. He said the only reason his brother was admitted to the FEU Hospital is that his father had a cousin who worked as a nurse there, and facilitated the patient�s confinement in the charity ward. In doing so, Villar only succeeds in causing the cracks in the story start to break wider. Villar told his Bombo Radyo audience that his brother was regularly examined by the �family doctor� as there were almost no specialists as we know them today at the time. Poor families then, as it remains to be the case now, had barely enough money to see a doctor. For a family like the Villars to have a �family doctor� shatters the myth about their being poor. It is easy for Villar to claim that his brother died as a charity ward patient, but one thing is clear � his brother didn�t die because his parents had no money to buy his medicines. The documents didn�t stop at the hospital. It was also shown that Danny was taken to the Funeraria Paz, which was reported to be an upscale mortuary service back then. Villar tries to sidestep the issue by saying, �no, he was just embalmed at Funeraria Paz, but we held the wake at our house because it was too expensive there.� On this, Villar again insults the Filipino intelligence. The practice of holding funeral wakes at funeral parlors is a recent development. In the 60s and 70s, bereaved families did their mourning in their homes. Villar�s explanation provides no escape valve for his untruthful statement. Now that the authenticity of these documents are no longer being disputed, Villar�s assertion that all nine siblings slept on a single mat is also shattered. He is the second of nine children. If his departed brother is number three or number four, by 1962 the family would already have been living in San Rafael Village. How can all the nine siblings sleep on a single mat when by 1962, not all children have been born? It�s simple logic. And besides, no one will believe Villar if he says they still slept on a single mat in San Rafael. Lies, lies, and lies. 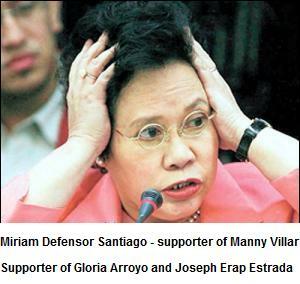 Villar�s father was a government bureaucrat. As a salaried employee, he was able to bring food to the family table, clothes and education for the children, and a decent home over their heads. Villar should stop desecrating the memory of his hard-working father who endeavored the provide the best for his children. Even today, a regular government clerk earns enough to keep body and soul above the poverty level. By Villar�s own candid admission, the house was a two-bedroom house, which is the usual size for starter homes. It was a bigger house than his standard housing units in his subdivisions. 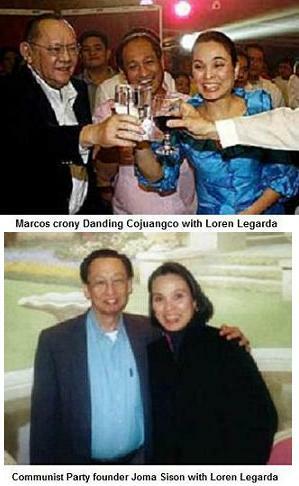 This is validated by Jun Borres, the fishing magnate from Iloilo who bought the house in 1987. �Villar grew up there, and it was definitely a nice neighborhood back in the 60s,� Borres told me. It wasn�t, as Villar contends, a lot submerged under a pool of water. The grant of the GSIS loan to build a house in 1962 contradicts Villar�s claim about the condition of the property. GSIS would not have approved the loan if it found the property unsuitable for the construction of a house. GSIS loans are categorized as supervised credit, meaning you can�t avail of the money unless the house is actually constructed. It must also be emphasized that the loan was for the construction of a house. This means the elder Villars had saved enough money to buy a 560-sqm. property before 1962! Villar knows that first-time home owners buy smaller lots. For his parents to have bought 560-sqm. in a gated subdivision means they had more than enough money. Villar is once again caught lying. The GSIS loan also provides a good clue on how much his father, Manuel Villar Sr. was earning from the government. As any GSIS member knows, the amount of loan is based on the salary level of the applicant-member. Sixteen thousand pesos might seem like small change nowadays, but was already a fortune back in 1962. It wasn�t a level that would be granted to a janitor or a clerk. Manuel Villar Sr. occupied a supervisory position. Not exactly the kind of person who would qualify as poor. Villar�s fraudulent life story is now shattered. He spun a web of fiction to project himself as champion of the poor because he came from the poor. The truth is coming out, and not even Villar can now disprove the facts that are rushing to the surface of the sea. Q: Are the Nacionalistas pro-administration or opposition? A: The Nacionalista Party is part of a coalition supportive of the present administration (Gloria Macapagal Arroyo). However, true to its character of independence, there are members of Congress who belong to the minority, and even positions taken by its leaders which may, at times, run counter to the dictates of Malaca�ang.